Thinking of taking part in a canicross event? Here’s what you need to know. Find out as much about the canicross event as possible. As well as the distance, check out the terrain (so you can plan your footwear), the likely number of participants (you may prefer a smaller race if your dog gets overwhelmed by too many people and dogs), the route (in the summer you will want a course with plenty of shade) and water stations (you may need to carry your own hydration pack). If you are entering a Park Run do also follow our guidelines. Arrive at the canicross event with enough time to do a recce of the area, to warm up and to give your dog a chance to relieve himself. Not rushing around will also help keep your dog calm (well, hopefully!) before the race starts. However, don’t arrive at the event too early if you have a high energised/excitable dog as too much hanging around may get them all agitated. Every dog is different of course – just be mindful of the environment that your dog is comfortable being in and don’t put them under any unnecessary stress. 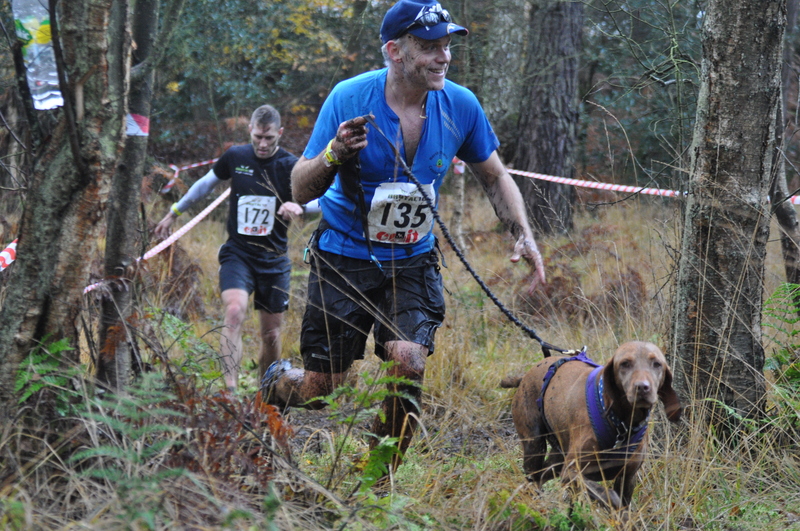 Dedicated canicross events tend to follow a staggered start where runners go off individually at intervals. However, canicross friendly races, i.e. dog-less events that welcome canicrossers, vary in how they manage the start for the canicrossers. Some ask canicrossers to set off en masse with the dog-less runners, some start the canicrossers a few minutes either before or after the mass start. Others, like Dogstacle, are very relaxed about their starts which makes for an equally relaxed and calm atmosphere for the dogs. Whichever approach they take it’s worth thinking about how your dog will react. For some dogs it can be very stressful joining a mass start, especially when they are waiting at the start line and excitement levels are heightened – so you may want to consider keeping your dog to one side or at the very back until the race starts…or perhaps not doing it at all. Practising and perfecting some handy commands will make a big difference to your overall race experience, whilst also building a great bond with your dog. Favourites such as ‘left’ and ‘right’ for technical courses and ‘with me/behind’ for those challenging downhill sections will help you race much more efficiently. When you overtake other runners, especially dog-less runners, be mindful that they may not be aware that there is a dog coming up behind them or they may not be too keen on dogs. Communication and a friendly approach is key here. Just call out that a dog is coming past on their left or right, keep a good distance as you overtake (ideally keeping the line short while you do) and thank them when they move to one side for you. Politeness and consideration goes a long way and ensures canicrossers are welcomed at future events. Always carry poo bags and be prepared to stop during a race if your dog does feel the need to poop! Hopefully if you’ve arrived at the event in plenty of time that has already been taken care of before the race itself has started. If you are doing a particularly long race, e.g. half/full/ultra marathon, then it’s worth thinking about hydration and nutrition and also running with a small rucksack with emergency supplies, such as water, collapsible drinking bowl, food, spare clothing and basic first aid kit. Some events will insist on this anyway so do check their rules. Do give consideration to the time of year and start time of the canicross event and whether your dog will be comfortable, e.g. is it potentially too hot to trot!? Follow this useful advice from vet Guy Heilpern if in any doubt. After the race it’s worth having a few provisions back in the car depending on the conditions. At the end of the race give yourself and your dog time to bring your heart rates down before jumping in the car and heading home, especially if it’s been a warm day or you have a long journey ahead of you. Not every canicross event is for every one and every dog. Some dogs thrive on a big mass canicross start, others fair better on staggered starts or less competitive races. Always put the needs of your dog first and be honest about whether they will enjoy it as much as you. Do contact the event organisers if you have any general questions – they are all happy to help. And if you find a local race that isn’t inviting canicrossers to enter that doesn’t mean that they won’t do so – it may be that they haven’t come across canicross before or simply want to keep it to low numbers. So do drop them a line and ask the question…and be sure to explain the merits of canicross! I would just like to say thank you so much for sharing all your knowledge regarding all the different aspects of cannicross. My partner has been taking part in the sport for a couple of years and now I am about to take the plunge!, so I have found your website most helpful. Hi Sue, thank you so much for your kind comments. I’m so pleased you have found our blog helpful and that’s fantastic news that you are about to take the plunge yourself! I’ve no doubt you’ll absolutely love it 🙂 If you do need any help or advice with anything, please don’t hesitate to ask. Best wishes, Gail.